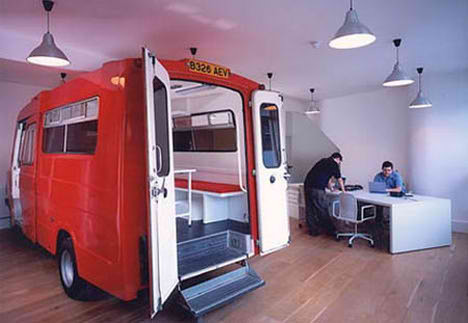 Some ‘office’ or spaces are no longer synchronize with a concrete bunker divided by carpeted partitions. The image above gives me the deja-vu feeling, reminds me of a boutique outlet in a shopping mall. They have this Morris minor car painted with fancy candy colours during the official opening but as times go by, what left are four flat tires. It is an eye-sore; I guess they never thought about flat tires. Reminds me of KU64 – The World’s Coolest Dental Clinic. Smart employers are realizing that a beautiful office space can inspire staff to be creative, so they’re investing in transforming their workplaces with the help of innovative and creative architects. p.s. On hiatus for the last few days, went back to my hometown and decay into boredom.